This Pavlov’s House review was made after playing the game five times. We were sent a copy of this game by the publisher in exchange for an honest review. 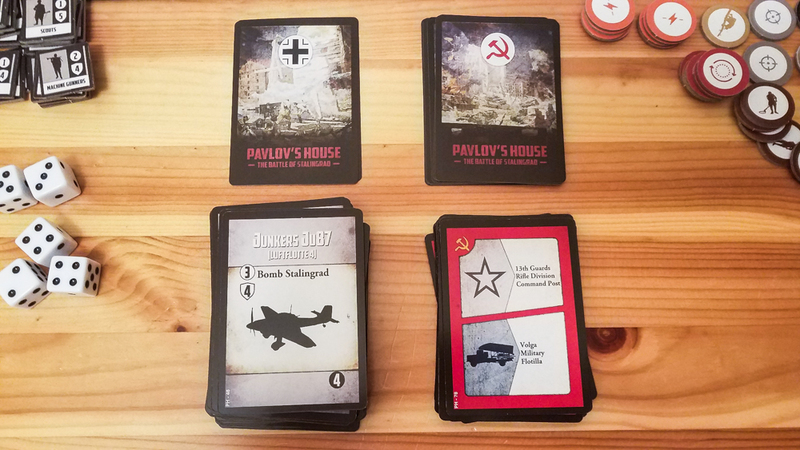 Pavlov’s House is a war game in which you play as the Soviets as they attempt to hold off the German forces over a two month period during the Battle of Stalingrad. It can be played solo, cooperatively (2 players) or competitively (2-3 players). Pavlov’s House was designed by David Thompson and is published by DVG. The Pavlov’s House board is made up of three sections that show the inside of the apartment building, outside the building, and the surrounding area where the Soviet reinforcements are located. There are also three color-coded sections inside and outside Pavlov’s House that show you where the Soviets and Germans will be attacking and defending. Each section of the building has a Defense value that represents the amount of protection the Soviet soldiers have. 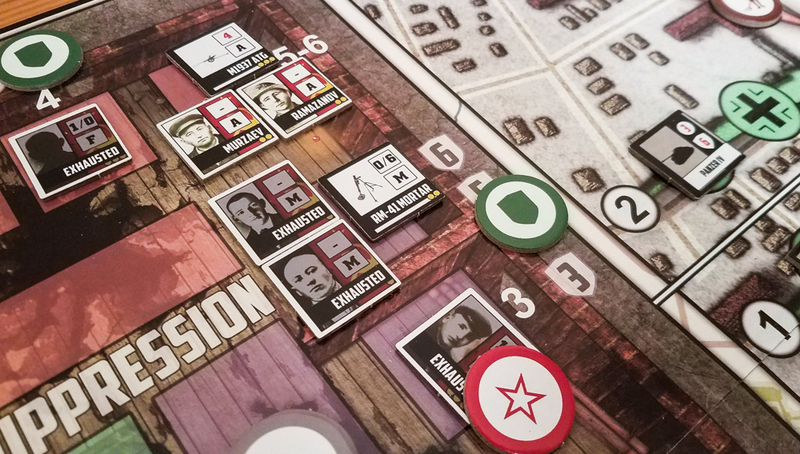 There are three phases in each round of Pavlov’s House: Soviet Cards, Wehrmacht Cards, and Soviet Counters. This is when you take actions for the Soviets that are outside of Pavlov’s House. You’ll draw four cards and choose three actions to take that round. You can send new soldiers and weapons into the building, set up anti-aircraft support, send sappers to slow the Germans down, and move supplies (food, ammo, etc. ), among other things. You’re also constantly trying to recover from the air bombardments that took place during previous Wehrmacht Cards phases. During this phase, the Germans will try different ways to assault Pavlov’s House and the surrounding area. There is a lot of dice rolling in this phase, representing the Germans’ movements and attacks. There are sniper attacks, soldiers and tanks moving into positions around the building, and bombing raids that add Disrupt tokens, potentially slowing you down during future Soviet Cards phases. There are also multiple Resupply cards in the Wehrmacht deck that will force you to feed each soldier inside Pavlov’s House. After you’ve resolved a Resupply card, it gets flipped and becomes a Storm Group card, which gives you a chance to send soldiers from inside the building on an assault mission against the Germans. The Storm Group cards give you the majority of your victory points at the end of each game. This is when you get to take some actions with the soldiers that are inside Pavlov’s House. You’ll first move soldiers into different positions and then three soldiers can take one action apiece. Actions include attacking enemies in line of sight, activating multiple soldiers to use machine guns and anti-tank weapons, and recovering (flipping exhausted soldiers back to their readied side or removing a Disrupted token). Some soldiers only have basic attack and/or suppress abilities, while others can have specializations such as commanding, activating artillery, or using more powerful weapons. You can gain an extra action if all three of the Soviet soldiers with the Command action are in combat positions. You’ll lose the game immediately if the Germans make it into Pavlov’s House, if there are ever zero Soviet soldiers inside the building, or if the Germans destroy the Soviets’ main command post. If you get through the Wehrmacht deck, you’ll figure out how well you did by counting up your points and comparing your total to the table in the rulebook. Once you’re used to the basic game, you can play with the Operational Support cards, which add in a resource management element to the game, and Tactics cards, which add in extra challenges each round. 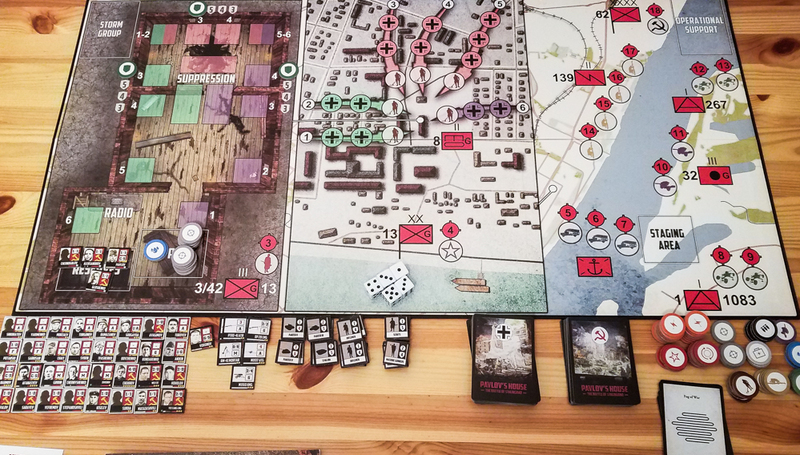 The rules for the two-player cooperative version of the game are the same as the solo rules except that one player controls the Soviets inside the building (Command) while the other controls the Soviets on the outside (Operational). In the competitive variant one player will play as the Germans and will be playing Wehrmacht and Tactics cards each round. That is a very basic overview of how the game plays. 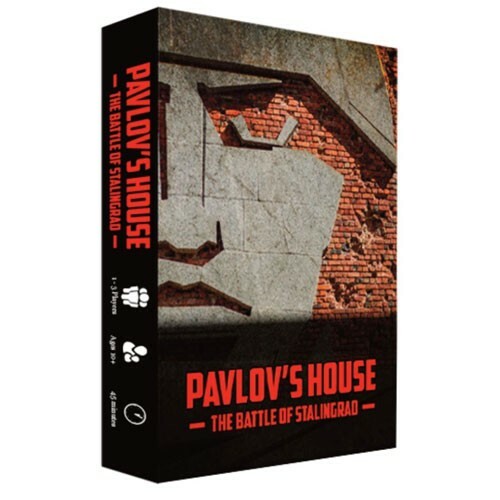 For more info, check out the official Pavlov’s House rulebook at BGG. The three-section board layout was a brilliant idea because it makes it easy to see the battle playing out over the three phases of the game. You have to make a lot of interesting and impactful decisions in this game. Do you send supplies to the soldiers in Pavlov’s House or do you instead set up artillery? Do you use your last action to attack with a weaker soldier or do you have one of your more powerful soldiers recover that round? I’d say about half of your decisions are tough ones to make, which is great. Setting up and executing different types of combos in the two Soviet phases is extremely satisfying. For example, you can set up artillery during the Soviet Cards phase and activate them during the Soviet Counters by using a soldier with the “Forward Observer” special ability to potentially take out multiple enemies. It’s easy to see that a lot of research went into making Pavlov’s House. The key soldiers from the battle are all in the game and seeing how the Soviet defenders set up outside of the building gives you a better understanding of how this battle actually played out. There’s a really good flow to the game once you know how all of the actions work. There’s very little cleanup to do at the end of each round which keeps you in the action throughout. Pavlov’s House was designed to be a solo game, but I honestly think it’s a little bit better as a co-op. Being able to focus on one of the two Soviet phases while also communicating with your teammate is a really cool experience. The three reference sheets are definitely appreciated because they helped us figure out most parts of the game as we played. I think the cover art is fantastic. Dice rolling is a huge part of this game, so there is potential for some unlucky and frustrating moments. For some reason I get extremely unlucky just about every time I try to use anti-aircraft defense during bombing raids. Analysis paralysis can be a problem, especially during the Soviet Counters phase. Once you have a lot of soldiers in the building you have to think who to move, where to attack, if you want to have one or more soldiers to recover, and a whole bunch of other things. The Defense Value tokens are a little large. I wish they were shaped like shields to match the symbols on the board. As you can see above, I don’t have any major issues with Pavlov’s House. It’s an exciting war game that plays well as both a solo and co-op game (I haven’t played the competitive variant yet). It has a tower defense / survival feel to it that I think a lot of people will enjoy. So far I’ve done well in two of the five games I’ve played (one solo, four co-op) and I’m looking forward to adding in the Operational Support and Tactics cards to see how those change the game. V-Commandos is still my favorite cooperative war game, but I could see Pavlov’s House hitting the table just as often, especially when I’m in the mood for a relatively quick two-player war game experience. If you’re into war games or this specific battle interests you, I highly recommend playing Pavlov’s House. I’d also recommend it to anyone that enjoys tower defense board games. UPDATE: Pavlov’s House made it onto our Best Cooperative Board Games of 2018 list! Thanks for taking the time to read our Pavlov’s House review! To stay updated on all things cooperative board games, follow us on Twitter, Facebook, or via RSS.